John Bell Hood was a prominent Confederate general who was known for his battlefield bravery during the American Civil War. During 1864, Hood's army attempted to stop Ohioan and Union General William T. Sherman's capture of Atlanta, Georgia. Hood was born on June 1 or June 29, 1831 at Owingsville, Kentucky. Hood's parents were Dr. John W. Hood and Theodosia French Hood. Although Hood's father wanted his son to pursue a medical career, Hood was highly influenced by the military achievements of his grandfathers. Hood's uncle, U.S. Representative, Richard French, obtained an appointment for Hood at the United States Military Academy in 1849. Hood graduated from the academy in 1853, despite receiving 196 demerits during his senior year, just four short of expulsion. After graduating from West Point, Hood served in California and Texas. He resigned his U.S. Army commission on April 16, 1861, after the Battle of Fort Sumter (April 12-13, 1861). When Hood's native state of Kentucky did not secede from the Union, Hood joined the Confederate Army as a captain in Texas. On February 20, 1862, Hood was appointed commander of Hood's Texas Brigade, and he was promoted to brigadier general on March 3. 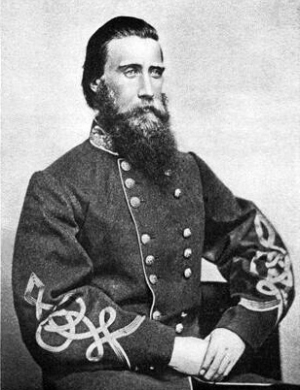 Hood's performance at the Seven Days Battles (June 25-July 1, 1862), defending the Confederate capitol at Richmond, Virginia, led to his promotion to division commander, serving under Major General James Longstreet. During the Second Battle of Bull Run (August 28–30, 1862), General Longstreet had Hood arrested and ordered him to leave the army after Hood engaged in an argument with a superior officer, but Confederate commander, Robert E. Lee, later restored Hood's command. Hood's outstanding performance at the Battle of Antietam (September 17, 1862) led to his promotion to major general on October 10, 1862. At the Battle of Gettysburg, on July 2, 1863, Hood lost the use of his left arm for the remainder of his life from an artillery shell explosion. Hood returned to action on September 18, 1863 in the Western Theater, where Longstreet's command had been dispatched. At the Battle of Chickamauga (September 19–20, 1863), Hood led the assault that resulted in the defeat of Major General William S. Rosecrans's Union Army of the Cumberland. During the battle, Hood was severely wounded, and doctors had to amputate his right leg just below the hip. Hood's courageous leadership at Chickamauga led to his promotion to lieutenant general on February 1, 1864. On July 18, 1864, Confederate President Jefferson Davis promoted Hood to the temporary rank of full general and gave him command of General Joseph E. Johnston's army, which was defending Atlanta from Union General William T. Sherman's advance. Although the Confederate Senate never approved Davis' actions, Hood's temporary promotion made him the youngest officer to achieve the rank of full general during the Civil War. Hood tried to break General William Sherman's siege of Atlanta with four offensive attacks, all of which failed and resulted in major Confederate casualties. After Sherman captured Atlanta, Hood tried unsuccessfully to prevent him from advancing on Savannah, Georgia by initiating an offensive campaign in Tennessee, but Sherman did not take the bait. Hood attempted several offensive actions in Tennessee toward the end of the Civil War, and suffered a devastating defeat at Franklin on November 30, 1864. With the Army of Tennessee shattered and retreating into Mississippi, Hood resigned his command on January 23, 1865, reverting to his permanent rank of lieutenant general. As the war was concluding, Hood surrendered to Union forces in Natchez Mississippi on May 31, 1865. After the Civil War, Hood took up residence in New Orleans, Louisiana, where he operated a cotton brokerage and an insurance company. In 1868, Hood married Anna Marie Hennen and fathered 11 children. An outbreak of yellow fever in 1879-1879 ruined Hood's insurance company financially and left him impoverished. As the epidemic waned, Hood and his wife contracted the disease. John Bell Hood died of yellow fever on August 30, 1879, just days after his wife succumbed to the same disease. Hood was buried in Lafayette Cemetery in New Orleans. Later, his body was moved to the Hennen family tomb at Metairie Cemetery, New Orleans.